Special Offer. Buy 2 Bottles for £82.50 each. Save £5.00 !! An intense nose of freshly made strawberry jam and mingle with cinnamon, cardamom, honey and pink praline. On the palate it is layered and complex with notes of liquorice, blackberry tea, cherries, pink peppercorns and fresh figs. The finish is long and sophisticated. This Rose was made from a selection of 15 crus throughout Champagne. 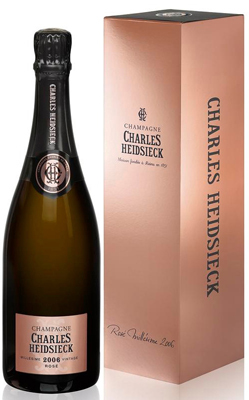 The Chardonnay was picked from Oger, Mesnil-sur- Oger, Cramant and Vertus - all mainstays in the classic Charles Heidsieck blends. Key vineyards for the Pinot Noir were Avenay, TauxiËres, Ambonnay and Ay. Grapes which make the red wines for the rosÈ element were from Bouzy, Ambonnay, Les Riceys, Verzenay and Hautvillers. 2006 in Champagne presented various challenges in the vineyards, which ultimately led to a very successful harvest. Winter was very cold, with heavy snowfall across the region. The spring that followed was punctuated by violent thunderstorms, leading to a scorching July, then a cool August. The alternation of hot and cool weather was very beneficial for the maturation of the grapes. The Pinot Noirs were particularly rich, leading Charles Heidsieck to select this year to make a vintage Rose. After the first fermentation, the wine is racked to separate the lees and then undergoes malolactic fermentation to soften the natural acidity. 8% of the blend is vinifed as a red wine. After blending, the cuvÈe is bottled and selected yeast added to begin the second fermentation. The bottles are placed in the cellar at a temperature of about 10°C to age for a minimum of 8 years before release.